New Albany City Hall is located at 99 West Main Street, New Albany, OH 43054; phone: 614-855-3913. Photo: George and Christina Ealy House, ca. 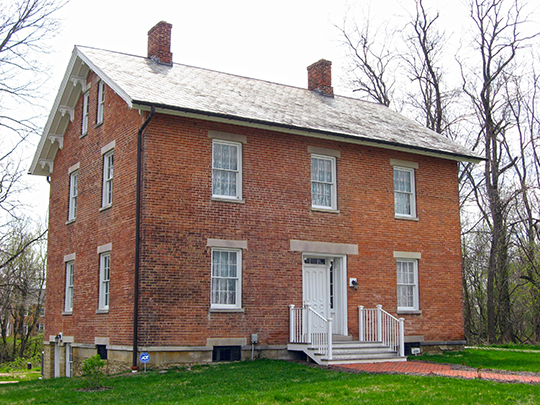 1860, 6359 Dublin-Granville Road, New Albany, OH. Listed on the National Register of Historic Places in 2008. Photographed by User:Nyttend (own work), 2011, [cc0-by-1.0 (creativecommons.org/publicdomain/zero/1.0/deed.en], via Wikimedia Commons, accessed February, 2016. New Albany is located in Franklin County, 15 miles northeast of downtown Columbus, Ohio, within Plain Township in Franklin County and Jersey Township in Licking County. The area that would become New Albany was first settled in 1837 by Nobel Landon and William Yantis. The city was first incorporated in 1856.